The exponential growth of electronic usage in global commercial transactions has generated potential opportunities in productivity, facilitated the cross-border free movement of goods and service, and stimulated export and import trade as well as domestic sale, but at the same time, it has led to new challenges to existing laws due to the unique characteristics and complexities of online technology, culture and social behaviours. 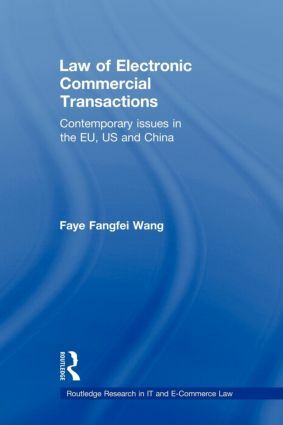 This book compares the legislative frameworks of e-commerce in the EU, US, China and International Organisations. It highlights and analyses the main legal obstacles to the establishment of trust and confidence in doing business online. It provides an in-depth research into finding solutions to remove the barriers to the validity of electronic contracts and signatures, the enforceability of data privacy protection, the determination of Internet jurisdiction and choice of law, as well as the promotion of online dispute resolution. It encourages modernisation and harmonisation of laws concerning electronic commercial transactions through well-balanced area-specific international instruments. Law of Electronic Commercial Transactions will be of great interest to academics, legislative organisations, practitioners and lawyers in the field of international commerce. When is an electronic contract made?